Charmarite-2H, charmarite-3T, quintinite-2H, quintinite-3T and caresite-3T are a group of new carbonate minerals with the general formula M2+4Al3+2(OH)12CO3 · 3H2O (4:2 minerals). They are structurally and chemically related to the hydrotalcite- manasseite group (6:2 minerals). Superlattice reflections in the single-crystal X-ray photographs suggest ordering of cations in the 4:2 minerals, whereas the cations of the 6:2 minerals are disordered. 2H and 3T designate the 2-layered hexagonal and 3-layered trigonal structures, respectively. 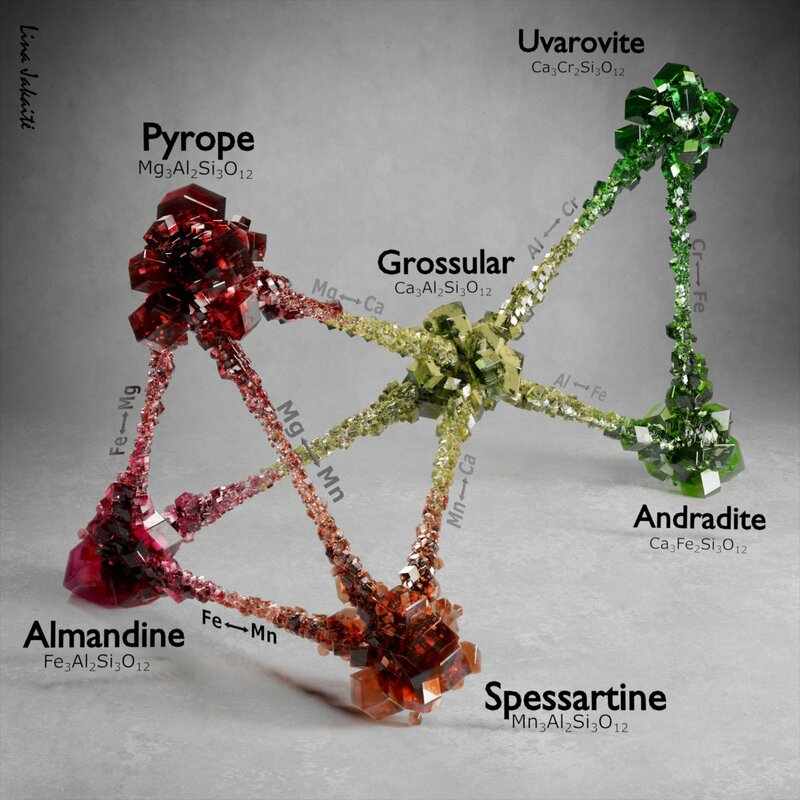 All five species are late-stage hydrothermal minerals in alkaline rocks, and are associated with many rare mineral species. Quintinite-2H occurs at Jacupiranga mine, São Paulo, Brazil; charmarite-2H, charmarite-3T, and quintinite-3H occur at Mont Saint-Hilaire, Quebec; caresite-3T occurs at Mont Saint-Hilaire and at the Corporation Quarry, Montreal, Quebec. e 1.533(1); caresite-3T is uniaxial negative, w 1.599(1) and e 1.570(1). All are generally pleochroic, with only the near-end-member quintinite-3T being non-pleochroic. IR spectra are given for all five species.